We all are walking around in the the network. Networking is called like group either they are people or anything else. In the past having time people would be maintain their social network for that they had to go and join the networks. But this time is not like that. People have no time for the same. They are all busy to get the their achievement or targeted work. Despite its they have not forget their community and to cover them they have invented lots of popular social networking apps. With that they always in touch of all networks. 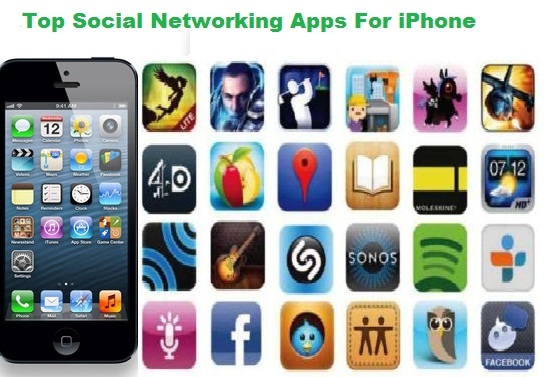 Bellow is top social networking application and their details for your Mobile devices. Which you use that daily, weekly, hourly or monthly. The folks at Facebook know a good deal about social networking, and they used that knowledge to create one of the best iPhone apps on iTunes. This free app closely resembles the Facebook website, and you can do pretty much everything you would there: update your status, comment on posts, approve friend requests, and upload pictures. The photo albums can be slow to load, but any Facebook user would benefit from downloading this app. Meebo consolidates dozens of chat services (Facebook, MySpace, AOL Instant Messenger, Yahoo! Messenger, and more) into one easy-to-use app. Not only is the app free, but the interface is much more streamlined than its competitors, which tend to look cluttered. Setting up your Meebo account is quick and easy, and the app supports push notifications to alert you of new chats and replies. Skype users may be disappointed, however, since that service is not supported. The imo Instant Messenger app (Free) is a great way to keep in touch with friends on multiple social networks. It supports MSN, AOL Instant Messenger, Facebook, MySpace, and more. Imo is also one of the few chat apps that support Skype -- even Meebo lacks this feature. I like that you can sort buddies into different lists to keep things organized, and the imo app includes a buddy favorites list and searchable chat history. The app supports push notifications, but that feature only works for 72 hours after your last login. Got more than one social networking account, but want to manage them all from a single app? Seesmic may well be the best choice available. It supports Twitter, Facebook, and Ping.fm (which supports LinkedIn, Blogger, WordPress, and many other services) and allows you to post to all of them from a single interface. To make it even more appealing, it's free! While it lacks some of the nice lower-level features that official or dedicated apps do, the trade-off of being able to manage multiple accounts in one app more than makes up for it. TweetDeck may not have all the reporting features of paid Twitter apps, but this free app is an unmistakable value. TweetDeck makes it easy to manage multiple Twitter accounts with a streamlined, column interface where you can easily swipe to move between your friend list, mentions, and direct messages. It's also simple to fire off new tweets or upload photos using twitpic or yfrog. The app doesn't support Twitter lists yet, but for a free Twitter app, TweetDeck is hard to beat. There are a number of iPhone apps that can help you make avatars for social-networking sites, but few can match Uface. The app has an excellent interface and the avatars look like they were drawn by professionals. Uface has more than 300 facial characteristics, so it's easy to create a realistic avatar. The app is a little on the pricey side, but if you want a unique avatar for Twitter or Facebook, you'll want to check this one out. Location-based social networking apps are all the rage, but our tests show that some are more hype than substance. We were largely impressed with Gowalla, a free app that uses the iPhone's built-in GPS to determine your location and suggest things to do nearby. The trip feature, where users create a list of must-visit locations in a certain area, is very interesting, especially if you're in a new city. Like most location-based apps, Gowalla works best in large cities where it has more users.